After my first trek to Charmadi in October, I had decided to visit the Ghats again at least 3 more times. With that I would have covered many significant peaks and waterfalls in this range. So here I was in November planning for my 2nd trek to the region. Our guide Isubu of Charmadi prefers to have more people for company. Hence he had instructed me to come at least in group of 6. Moreover in this region, the trek works out economical if there are enough people to fill a jeep as we have to engage a jeep to reach the base points of the trail. So this time we are 7 of us: I and my wife Veena, Sreekanth and his colleague Eti, Ashok and his fiancee Ramya and Ashwin, Ashok’s brother. Ramya is a complete beginner for treks. Ramya appears confident; we aren’t sure if her confidence in scaling the peak is strong or her inclination to be with Ashok is stronger. Ashwin is apprehensive of his fitness to complete this trek, but finally decides to join. We reach Dharmastala at 6.15AM on a Saturday morning. After breakfast and return ticket reservation, we set out to Charmadi in a jeep. It is 8.30AM when we reach Charmadi. This time our plan is to trek to Minchukallu peak on day 1. 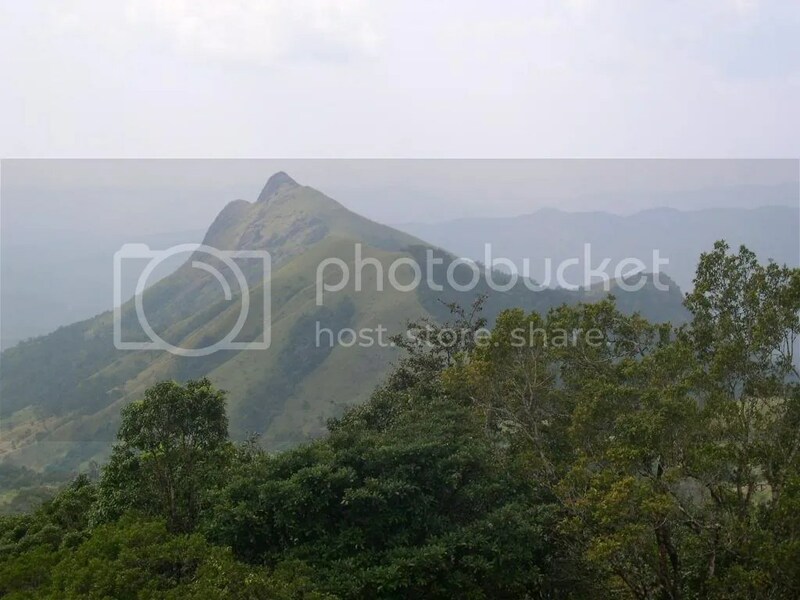 As per Dinesh Holla of Youth Hostel Mangalore, this is the highest peak in this Charmadi range. We board two Autos and reach Kakkinje village at 9AM, where we shift to a 4 wheel drive jeep. The jeep enters the kaccha road in no time. It is less of a road and more of a rocky terrain. It is more than an hour since we started when we reach a place which looks something like a dead end. Isubu has missed the route and the jeep has to backtrack for a couple to kilometers before finding the right path. After another 30min the jeep finally stops beside a tiny stream in a fairly dense forest. Our trek starts from here. Isubu informs the jeep driver to pick us up at 6PM in the evening. But the pickup point is different from this as we plan to get down from the Kumbhakallu side in the evening. The trek starts with an initial steep climb through the forest. Most of us are already gasping for breath. During my last trek to Charmadi in October, the weather was nice and cool. But this time it is hot and humid. My thermometer reads 34C. We emerge out of thick woods only to be confronted by grass almost 5ft in height. The trail is nowhere in sight, but Isubu has some sense of direction and we follow him navigating the tall grass. It is around 12PM when we take the first break. The Banana (the Nendra [Kannada word] variety) which we had picked up from Ujire tastes very good. We are told that infact they are very nutritious. Ashwin looks tired and he is already thinking of staying back and joining us when we return from the same path. But after a bit of encouragement and a dose of glucose Ashwin is ready for the next lap. Now we have gained some altitude (700m to be precise) and are walking in the grassland completely exposed to sun. We are taking frequent breaks and Ashwin keeps lagging behind. While Ashwin wants to stay back, Isubu isn’t happy leaving him there. The route we have taken is frequented by elephants and Isubu isn’t comfortable leaving Ashwin alone there. As Ashwin gives up, Ashok takes the responsibility of staying with him until we get back from the peak. So we move ahead leaving Ashok Ashwin pair behind with a wireless set. Ramya is looking visibly tired but decides to come with us. We have been seeing the Minchukallu peak ever since we started; it looks so near but we are walking towards it all the time. We cross a couple of small hills on the way and a valley where we replenish our water supply. The stream is too tiny to collect water directly into our bottles. Isubu quickly chops off a bamboo shoot which we employ as pipe to direct water into the bottles. It is around 1.45PM and we are feeling hungry. That is when we realize that we have left our lunch pack behind with Ashwin. We have to survive on oranges and sweet lime until we rejoin him. We take a break on a rock finishing our final stock of fruits. Ramya looks exhausted but it is too late to turn back. She says that all peaks look similar and wonders if it makes any difference if we scale Minchukallu today. We have no answer, we just get going. We keep in touch with Ashok over the wireless and inform our progress, or rather Ramya’s progress to him. After sometime we are no longer in the line-of-sight range and our communication ceases. At around 2.30 in the afternoon, we are finally on Minchukallu peak. This peak is at 1343m as per my altimeter. Veena looks visibly relieved after reaching the peak. We can’t stay long here as we have absolutely nothing to eat. We spend half an hour of photographic moments at the peak. Isubu is hopeful of spotting elephants or bison from here, but we find none. So we start back on our return trek. Isubu mentions that it will be 8PM by the time we reach the jeep pickup point, but we don’t believe him. We think that he is just trying to get us walk quickly. It is around 4PM when we rejoin Ashwin and Ashok. We get a new lease of life after eating chapattis. From here we take a diversion towards the Kumbhakallu peak. Not many of us have the energy left for another climb as per the original plan. So instead of taking Kumbhakallu head on, Isubu is now taking us beside it. Everybody seems to have already decided that the trek is almost over. Most of us extremely tired. When that happens, legs stop coordinating with the brain. That is when people start slipping and falling down. The trail completely covered by grass doesn’t help us. We keep falling down every now and then. While Ashwin leads the group with maximum number of falls, Eti competes with him. Ramya is also close behind. Even now we are not aware of what lies ahead of us. We are hopeful that once we cross Kumbhakallu we will reach the jeep pickup point. Isubu has become silent. He no longer responds to the queries about the remaining distance. We cross Kumbhakallu at around 5.30PM and reach a valley. It is beginning to get dark; especially in the dense growth of the valley, it is even darker. At around 6.30PM it becomes pitch dark. So now we are walking silently in a line guided by torches. There is no energy left to complain about the terrain; there are bigger issues to worry about. What if our jeep driver decides to return back not finding us at 6PM ? Even Isubu appears clueless at times about our next plan of action. After an hour’s walk, we are finally out of forest and hit a jeep track. We walk for half an hour on this track to reach our destination. But the jeep is nowhere in sight. Isubu checks with the only house here and they have seen nothing of the jeep. We are in a private estate and there is no hope of getting any vehicle here. Isubu silently moves ahead and we follow. It is 8PM and we see a vehicle approaching us. It should be a jeep and it should be our jeep. Who else would come here at this hour ? The jeep had in fact arrived here at 6PM but without finding us, the driver had gone to check out the morning’s drop point in case we returned from there. Not finding us there, he was making a second trip to this place. We are completely dependent on the driver in these places and fortunately drivers are sensible enough not to let us down. 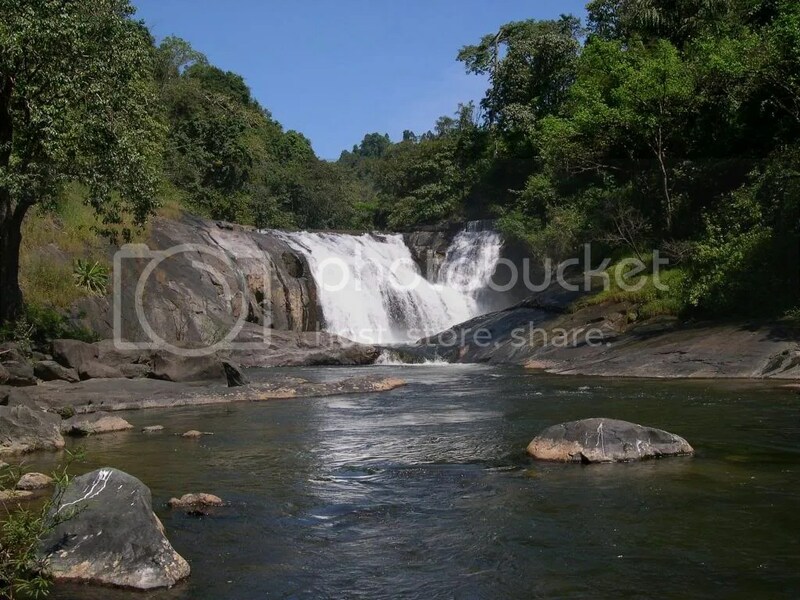 We come back to Charmadi and book the last 3 remaining rooms in the Hotel Mavantoor of Ujire. It is 9.15PM when we check into the hotel. Only in the bright surroundings of the hotel that we become conscious of our appearance; we need a wash. After a good dinner and a thorough wash we end the day. It has indeed been a very long day. We get up leisurely on Sunday. Ashwin and Eti decide against joining us on the 2nd day. We reach Kakkinje village where we are joined by Isubu and Asman, Hasanabba’s son. Today the plan is to reach a waterfall named Dondale fall. Again we book a jeep to reach the base of the trail. At around 10AM our jeep approaches a private estate which we have to cross. Isubu’s attempt to let us in fails this time and we are forced to divert to an alternate route. This turns to be a blessing in disguise as the jeep track ends near the Aniyur stream. Our trek begins today by crossing this stream. Though the stream is just knee depth, we end up having a few tough moments crossing this stream since the current is strong. We cross a mildly dense forest after that and enter a village and walk besides some fields. We again hit the forest, this time pretty dense. Humidity is at its peak and temperature is 35C. And the trail has leeches and plenty of them. We walk alongside the stream for some distance. The sight of a river flowing in a dense forest is so beautiful. The wilderness of the surroundings is very inviting. We reach Dondale falls at 12.15PM. Every waterfall is attractive and this one is no exception. This waterfall is quite wide and there is a large rocky area by the side of the stream which is under shade. There is a lot of space here and it is an ideal place for a night camp. We spend close to 2 hours relaxing at the falls. I and ashok spend sometime bathing in the cold water. At around 5.30PM we are back in Ujire and quickly vacate the hotel to spend more time in Dharmastala. First we climb (by steps) the small hillock in Dharmastala where there is a 14m statue of Bahubali. The adjoining area is vast and there is some serenity in this place. Next we join the long queue of people wishing for a glimpse of Lord Manjunatha of Dharmastala temple. Today there are more devotees and it takes us an hour for this. The temple offers lunch and dinner to thousands everyday. We too finish our dinner in the temple. We then proceed to the new big KSRTC bus stand of Dharmastala to start our return journey to Bangalore. Isubu has already given me the itinerary for the next Charmadi trek, the Banjar peak and the Banjar falls. 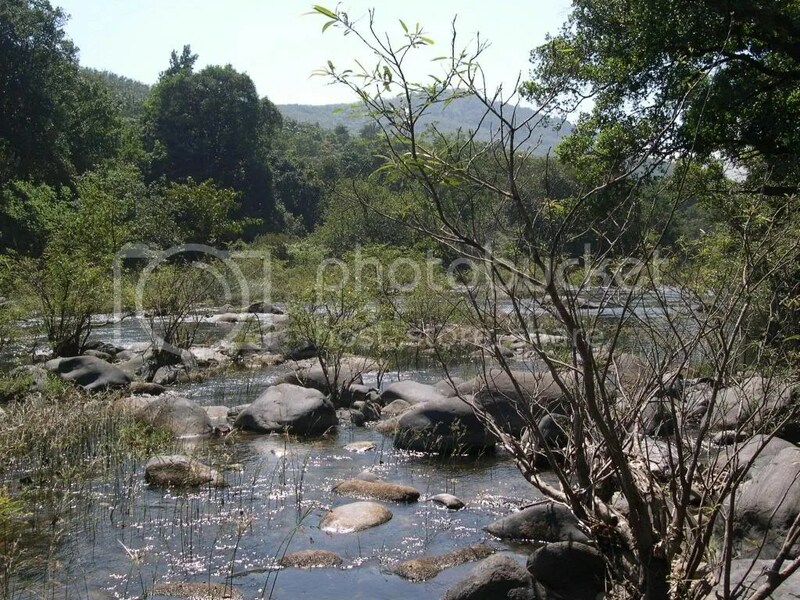 Charmadi Ghats is a range in Western Ghats of Karnataka bordering Dakshina Kannada (DK) and Chickmagalur districts. The part of Ghats which I would be exploring starts near a village named Charmadi. It is not sure if the village gets its name from the Ghats or vice versa. 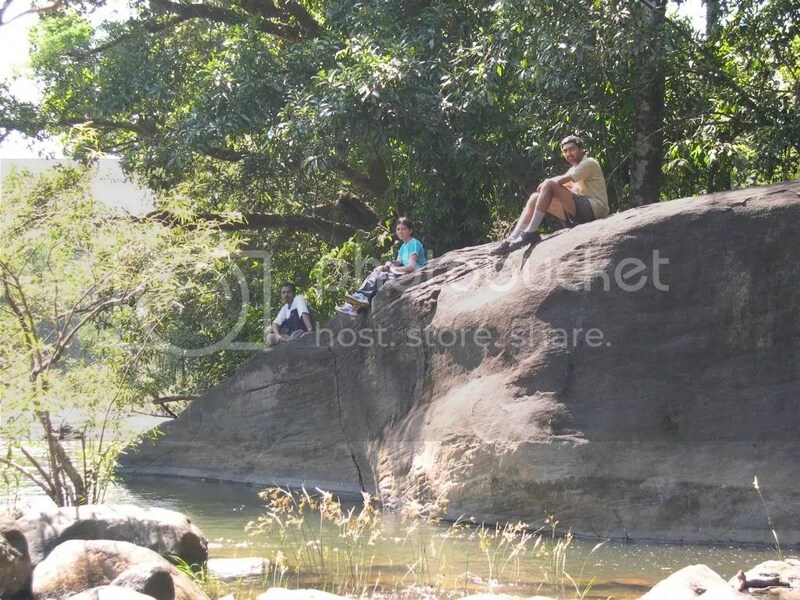 Charmadi, a very small village, is approachable via Dharmastala and Ujire from DK side. Not many people had reported much about trekking in this area. Dinesh Holla of Mangalore, associated with the Youth Hostel there, provided information about the routes and the local contacts. Youth Hostel, Mangalore arranges treks to this place frequently. The local contact Hasanabba is a social worker in Charmadi and is well known through out the area. He runs a hotel called “Hotel Charmadi” which mainly caters to the truck drivers (the highway connecting DK and Chickmagalur passes through this village). The guide Isubu is a middle aged man who works for Hasanabba and who has spent around 40 years in this region. He knows every inch of the forests here. With such a well informed local guide, it is possible to explore those unfrequented routes, which otherwise is not possible. It was mid October when Bharadwaj (more familiar by his nickname Pilla) and I decided to check out the Ghats of Charmadi. As always we begin our weekend trek on Friday night by an overnight bus journey from Bangalore to Dharmastala. The unprecedented rains which had inundated Bangalore had just stopped. Hasanabba informed from Charmadi that it was raining mildly there but that shouldn’t stop us. Pilla meets a colleague (a native of Ujire) of his in the bus and he instantly calls us mad for having ventured upon a trek in this season with just two of us. Added to that, Pilla also meets his company’s HR who couldn’t resist from commenting if she would see Pilla back in office again. Not a good beginning but we are already on our way. The Rajahamsa bus arrives in Dharmastala at 5.30AM . Dharmastala temple complex has good staying arrangements for devotees. We finish our morning ablutions in the well maintained community toilets. We also finish an early breakfast in Dharmastala. Buses ply regularly on Dharmastala – Ujire route. From Ujire one route goes to Mangalore and the other to Moodigere (of Chickmagalur district) via Charmadi. Ujire is around 10km from Dharamstala and Charmadi is further 15km from Ujire. We take a jeep and reach Charmadi at 6.45AM . It looks like the village is still sleeping. It is Ramzan time and we had to wake up Hasanabba from his morning sleep. After some wait me meet our guide Isubu. Isubu is the corrupted form of his original name Yousuf! We had come for trekking, but instead we are walking back from Kottigehara village towards Alekhan falls on asphalted road. Weather is soft on us and the surrounding mountain views are extremely beautiful, so we haven’t lost anything, we feel. Moreover Isubu talks non-stop recounting many interesting events of Charmadi Ghats. A car with a Sardarji and a foreign lady drives past us, stops, reverses and approaches us and offers us lift. We are pleasantly surprised. But for reasons best known to Isubu, the offer is turned down. We finally arrive at Alekhan falls. While Alekhan falls is visible completely from the roadside; one can also get down a few meters to reach the base of the falls. After a long walk on the road we reach the starting point of the trail to Bidirutala hill at 12PM . The beginning of the trail is wide and looks like an abandoned jeep trial, but quickly it narrows down and becomes steeper. It takes an hour for us to reach the Bidirutala hill. The view from the top is spectacular and we can see green mountains all around as far as the eyes could see. I have seen many parts of Western Ghats (like Pushpagiri/Kumara parvata, Mullaianagiri, Narasimhaparvata(Agumbe), Kodachadri), but I can’t remember anything like this in terms of vastness and natural beauty. 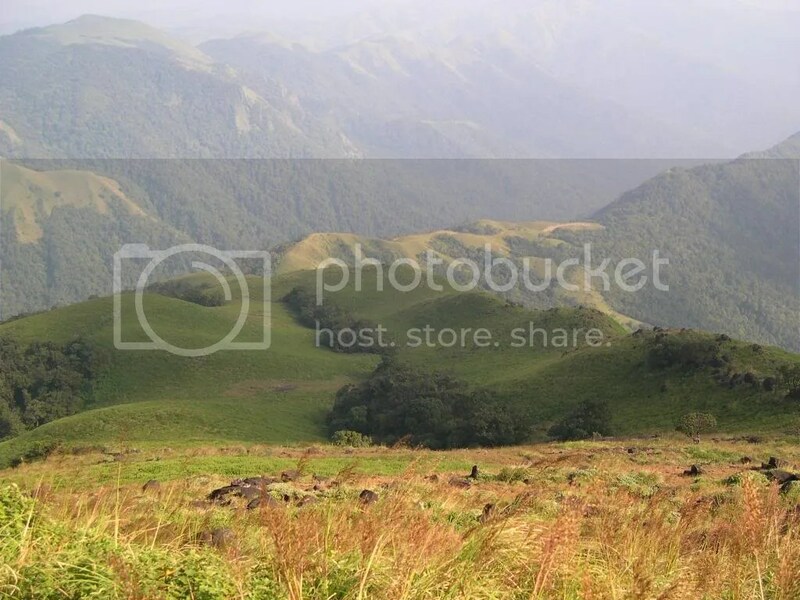 Charmadi Ghats are simply amazing ! We spot a few bisons grazing on a distant hill as we move along. Clouds cover us from everywhere and it appears as if it will pour. We quickly finish our lunch of Chapattis and MTR RTEs. 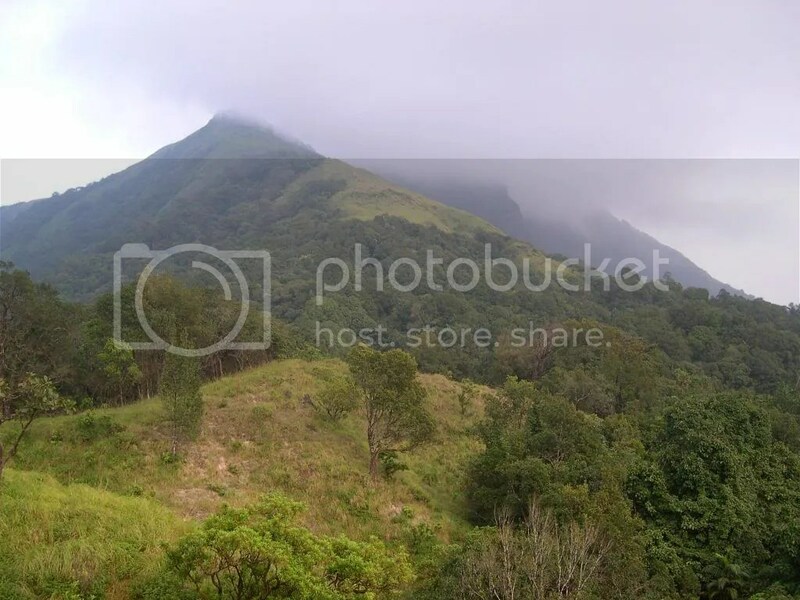 Our next destination is Barekallu(or Balekallu) peak. We cross a couple of small peaks on the way. At some places Isubu gives us options; either to cross the peak on the edge or through valley. On the edges, usually there is only grass and in the valley we can find dense forests. Thus we move ahead by alternating between grasslands and forests. Here the definition of Shola forests seems to fit the best; vast grasslands separated by narrow dense forests. If it is sunny to walk in the open grasslands, we have to face the leach wrath in the dense forests. Isubu is equipped with a paste made out of Nashya [Kannada word] powder and coconut oil, which when smeared on shoes will keep the leach away. 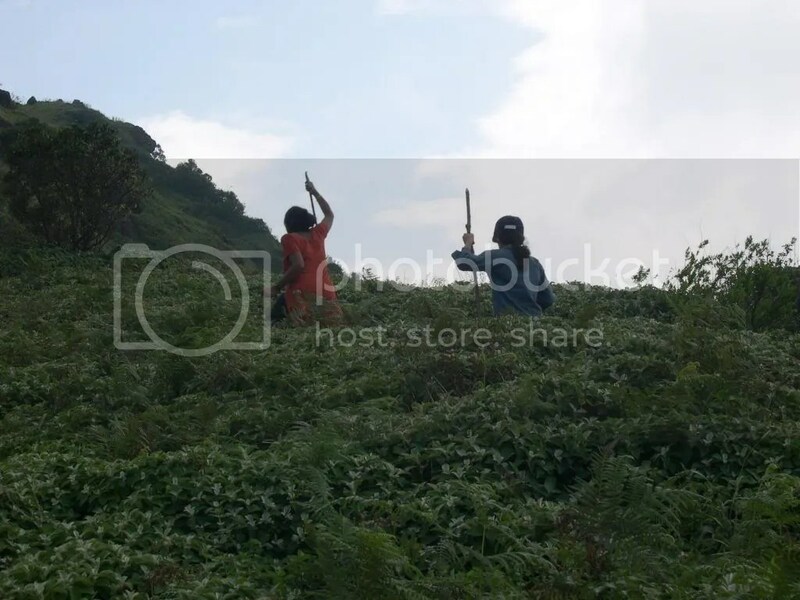 At 3PM we are at Barekallu peak. Since Barekallu is at significant altitude, many peaks in the range are visible from here. One can see Jenukallu , Kodekallu, Yerikallu, Minchukallu and Kumbhakallu from here. 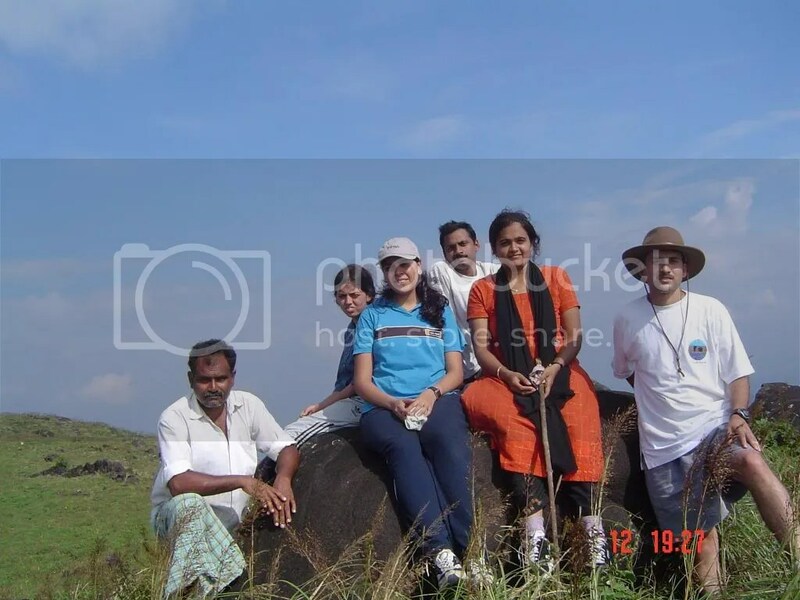 We spend half an hour on the peak before starting to our next destination – Kodekallu. 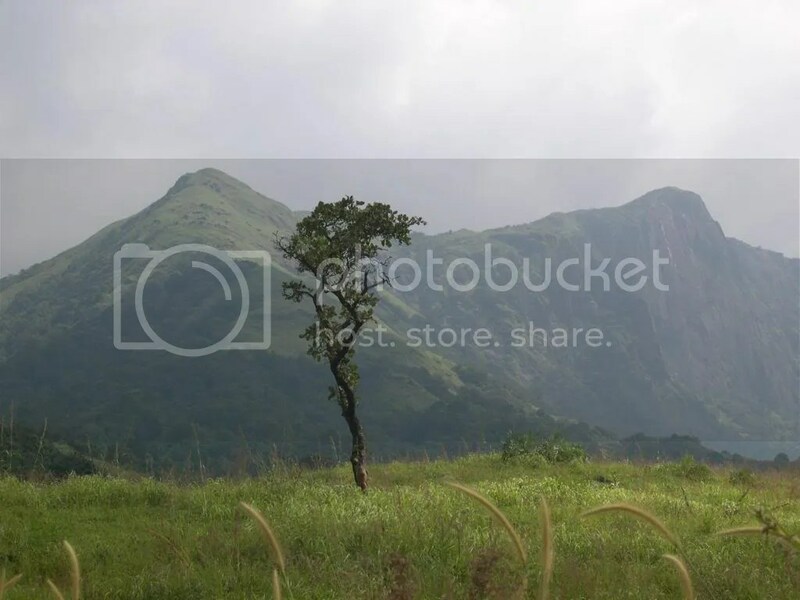 Kodekallu [Kannada translation: kode – umbrella, kallu – stone] has a big umbrella like stone on its peak. We spot bear pug marks in this place. We spend sometime in the peak enjoying the serene atmosphere here. From here Isubu took us through a downhill trek in a rocky and shrubby terrain. The highlight of this part of the trek was sighting a porcupine from a very close range. Isubu would have liked kill it for meat but we turn down the idea. At around 5.30PM we emerge out of the woods and enter the road. We keep walking towards Charmadi in a hope to catch a passing vehicle. We walk for around 2 hours, waiving in vain at every passing vehicle for lift. Finally a lorry stops and puts and ends to our misery on the road. After finishing the trek in the woods, it is kind of hard to recharge ourselves again for such a long walk and wait. The lorry driver knows Isubu and that’s the reason he had stopped. We can’t imagine where we would have ended up otherwise. Lorry driver recounts some crimes that have happened here over years. It appears that many killers dump the bodies in the forests here. But people keep finding them out and Isubu says he himself has spotted a body once. Because of all this trucks don’t stop anywhere in between (of course private cars are out of the equation anyway) in these Ghats . This driver is a typical of a lorry driver, drunk, and talking endlessly about his life as a driver, from which we get some idea about their tough lives as drivers. So finally at the end of the day one, we make an entry into Hotel Mavantoor in Ujire in our dirty trek getup and with the lorry driver for introduction. It takes an effort to remove all the leaches from our shoes and clothes. After a refreshing bath and a sumptuous dinner, we crash for the day. to use the adjoining forests for forest products like leaves, dried up wood etc. But they are not allowed to do logging. Many still hold on the forests allotted to them at that time. Isubu mentions that YNK estate controls around 3000 acres of forest around the estate. So now we had to get permission from these people to cross the estate and reach our destination. No one is allowed inside the estate even for trekking purpose without permission. But Isubu uses his influence to let us in and the presence of Asman, Hasanabba’s son also helps. Asman a 9th standard student is keen on trekking in Charmadi and he usually joins any group which comes for trekking in this area. The initial trail from inside the estate is a jeep track. We cross a couple of human settlements also along the way. People who work in the estate live here. We cross a beautiful stream named Banjar on the way. For more than a kilometer the path is alongside a canal which has been constructed to direct rainwater towards the turbine run power generation unit. The power generated here by naturally flowing water is enough to illuminate around 30 houses in the village, mentions Isubu. The rest of the path is through some dense forests. We reach the Kallarabhi falls at around 12 in the noon . Isubu had to clear a lot of bamboo growth before we could approach the water falls. As expected the falls is spectacular, but rocks haven’t dried up yet and entire area is very slippery. One wrong step and we could end up in the downstream of Banjar. So in this season of rains, there is not much moving space near this falls. Pilla and I take a quick bath and we finish our lunch here. It is 4PM when we are back on the road and again we had to wait for an hour for any kind of transportation. This time we manage to get a local bus which drops us at Charmadi. After saying goodbye to Isubu and Asman we take leave from Charmadi, again in a lorry. Our return bus from Dharmastala is at 11PM and hence we had enough time to visit Manjunatheshwara temple in Dharmastala and have temple dinner. You are currently browsing the Bharata B Rao's Blog blog archives for December, 2005.